Our violet glow powder produces the most striking violet color you will find in a glow material. We constantly get comments from customers and manufacturers that use this product about how much they like the color. It is not as bright as out other glow powders primarily because the Human eye is much less sensitive to the violet end of the spectrum. It also takes a tad longer to fully charge but the beautiful violet glow this material produces is without equal. 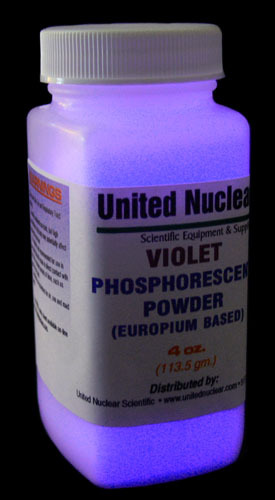 Our Europium UltraGlow® phosphorescent (glow-in-the-dark) powder is the brightest, longest lasting, non-toxic & non-radioactive, glow-in-the-dark material known. Based on the Rare-Earth element Europium, UltraGlow® powders are a new generation phosphorescent material with an astonishing glow time as long as 30 hours! UltraGlow® is a new generation Phosphorescent material at the cutting edge of chemical phosphorescent technology. It is a product of the U.S.A. and not some cheap Chinese knock-off glow powder that you see on auction sites. UltraGlow® powder can be mixed with anything from clear paint, to wax, plastic, clear nail polish, gel, plastics, glaze, etc. Several large manufacturers purchase this material from us in large quantities to produce a variety of unique glow items from paint to candles to plastic glow toys. For use in paint, best results are obtained by mixing as much glow powder as possible in a clear, non-water based paint. This glow paint should them be painted over white which acts as a reflector enhancing the visible glow. Painting glow paint over a black or dark surface will reduce the visible glow dramatically. Europium UltraGlow® powder can be recharged indefinitely just by holding it under bright light. Europium UltraGlow® powder is highly heat resistant. It can be mixed with glaze and fired in a kiln to make pottery and other ceramic items. Its temperature limit is about 1,200°F. Sunlight, ordinary indoor lighting as well as UV (blacklight) can be used to "charge up" Europium UltraGlow® powder. The more UV wavelengths the light contains, the faster it will charge. Sunlight (3,000 - 50,000 lux light level) will charge up the powder the fastest, requiring only 5 minutes of exposure. A 'workshop type' Fluorescent lamp (500 lux light level) is rich in UV light - holding the powder close to a bright fluorescent lamp will charge it up in about 10 minutes. An ordinary 60 watt incandescent (tungsten filament) lamp (30 to 50 lux light level) will take 30 minutes to charge up the powder due to the lack of UV wavelength in incandescent bulbs. UV (blacklights) will charge up the material extremely fast. The Excitation Energy is 200nm to 450nm. Peak Emission Wavelength is 520nm. Europium UltraGlow® powder has excellent Light Fastness compared to other glow materials. Other glow powders will degrade if constantly exposed to bright light. In 15 to 100 hours of exposure, the glow properties of ordinary glow powders become permanently reduced to a fraction of what they originally were. Not so with Europium UltraGlow® powder! Even after 1,000 hours under direct exposure to intense mercury vapor light, Europium UltraGlow® powder retains 96% of its glow output. In short, Europium UltraGlow® powder is a revolutionary glow-in-the-dark material. Its only limit is the user's imagination. Most people unfamiliar with Phosphorescent material have unrealistic expectation of how it performs. Europium UltraGlow® powders are a new generation of glow material much different than the old Zinc Sulfide based glow products of the past. In daylight, all the Europium UltraGlow® powders appear off-white in color. When fully charged, all glow powders will produce a bright afterglow for a short time, level off to a moderate level of brightness, slowly dimming over the remainder of the glow durations. The Green and Aqua glow powders will remain clearly visible for as long as 30 hours. The length of time a glow powder is said to 'glow' is defined as the time it takes for the afterglow brightness to diminish to 0.32 mcd (0.32 mcd is 100 times the Human visible perception limit). Even at this level, the glow is clearly visible in darkness. The Blue glow powder has a lower glow brightness and shorter afterglow duration compared to the Green and Aqua. This is partly due the response of the Human eye. Our eyes are much more sensitive to the color green as compared to blue. Green will always appear brighter to the eye. The Violet is the least bright of all the glow colors. All colors can be used as Fluorescent glow powders, that is they will all glow at full intensity under UV (blacklight) as long as the light is shining on them.